Inevitably, soon after the launch of the scheme in 2012, it quickly became apparent that the GUS had serious if not fatal funding difficulties. Put in money terms, the total annual employee / employer contributions are approx. £31 million at present – but benefits paid out are running at £89 million in 2014 – with the difference of £58 million being met by transfers from the Pension Reserve Fund of £32million and from taxpayers of £26million – clearly unsustainable in the longer-term. The Joint Working Party undertook extensive research in compiling their report, which included a large amount of helpful background information and various ideas and proposals to address the issues. To increase the standard employee contribution rate from 5% to 8% of salary, raising an additional £8 million per year, but which has relatively minor impact on the total benefit payout currently running at £89 million in 2014 and rising. To increase the minimum retirement age from 55 to 58 – with possible subsequent increases linked to longevity tables. In addition, as Tynwald confirmed, any changes to the scheme require extensive and time-consuming negotiations with staff and unions - but there is no mention of consultation with taxpayers or the private sector. 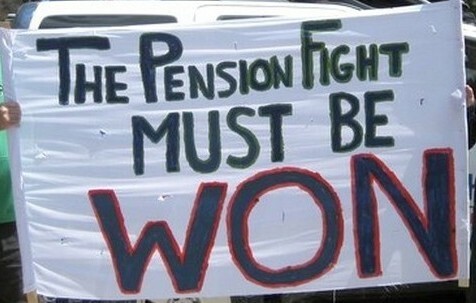 Unfortunately, the suggested amendments to the public sector pension schemes would appear to be too little and too late – and their work has anyway now been negated by subsequent delays actioned by Tynwald and by the Pensions Committee within the Public Sector Pensions Authority – the need allegedly for more time, more analysis, more consultation. Raising of the Minimum Retirement Age from 55 to 58 – has been removed. Unfortunately, a willingness by current Tynwald members to “kick the can down the road” and allow later administrations to take responsibility is all too evident, at which time the problem will have become that much more serious. It should also be noted that all members of the Working Party were either Tynwald members or public sector employees and thus beneficiaries of one or other Government Pension Scheme with an obvious conflict of interest or vested interest - no independent members were allowed - and no representatives for the taxpayer nor private sector employers and employees who fund 80% of the public sector scheme. That the Government Unified Scheme needs major surgery is now beyond doubt. However, it is a comparison with equivalent pension provisions in the private sector that reveals the yawning gap between the two sectors - and hence the resulting so-called "pensions apartheid". The issue behind the differences is that private sector schemes have to be fully funded by contributions from both employer and employee – with plans agreed with the authorities to fund any deficit which may exist over a number of years with extra payments. By contrast, most public sector schemes (excluding local authority workers who have separate funding arrangements) are currently largely unfunded – and pensions are paid “as you go” from current contributions by employer and employees plus a large top-up from the taxpayer. More than half of private sector employees on the island have no pension scheme provision whatsoever. For those fortunate enough to have a private sector pension, most employers have now closed their final salary schemes (due to the ever increasing costs and liabilities resulting from our increased longevity), and replaced them with defined contribution (money purchase) schemes - which generally result in much smaller pension payouts, usually only 25-30% of a salary-linked scheme. In the UK, all larger (and eventually, all minor) private sector employers are now required to establish an employee workplace pension scheme with automatic enrolment of all employees - this is to ensure that as many workers as possible make some provision for their pension needs in old age - albeit currently with only modest contributions of just 4% of salary by the employee and 3% by employer (plus 1% tax relief from the UK Government) – unlikely to generate the sort of pension we would all like. By comparison, our Treasury Minister has only recently announced the intent to consult further with employers and pension providers in the Isle of Man regarding the introduction of a compulsory workplace pension, and report back to Tynwald in July 2016 on the feasibility of the proposal. This is a complete “about turn” by the Treasury Minister as it has previously been declared there was no such intention - partly due to concerns about the impact upon local employment with the extra costs for employers, and partly due to the legislative load on Tynwald required to re-negotiate the existing GUS. So - the 20% of workers employed in government currently retain their extremely generous final pensionable pay scheme with no changes. Meanwhile, the other 80% in the workforce will be contributing as taxpayers to public sector pensions BUT with much inferior or perhaps no provision for their own pension needs..... not something that most will look forward to in old age. ...and giving rise to the potential for a major schism in our society. It is certain to become a significant social issue in the future. The longer the delay in enacting the radical changes required to public sector pensions, the greater the impact upon future generations of the liability. The demographic changes - the increased longevity, and the resulting rise in the proportion of older people to those of working age, means that the working population will be supporting an ever greater ratio of older, retired people. Perhaps weighed down by university fees and the credit card debts of the "I want it now" generation, our children and grandchildren are already struggling to do the things we expect of young adults - having families, buying property, making provision for savings and their own pensions. The expectation that they will have incomes sufficient to fund hospitals, education, social security, defence, police and all the other services government is required to provide appears to be a step too far. It would thus be reasonable that public sector pensions should become much more self-funded than currently, and less of a charge upon future taxpayers. As a matter of contractual commitments, all benefits already accrued by public sector employees must obviously be honoured. However, the urgency of the situation is such that a rapid transition to a new pension package is required, with all employees subject to new terms and conditions from a specified future date, say 2018. Having said that, the continuation of a "defined benefits" scheme such as the current final salary scheme is taken as a given - the disruption likely to result from any suggestion of a move to a defined contributions (cash purchase) scheme such as seen in the private sector is seen as insurmountable. the "accrual rate" (currently 1.5% of final salary per year of service for someone retiring at 65 years of age). Thus someone retiring at 65 after 40 years of service receives a pension of 60% of final salary. There are penalty adjustments to the accrual rate for those taking early retirement and favourable adjustments if taking later retirement. lump sum payments on retirement are currently given very favourable commutation rates as well as being tax free. Amendments to all these factors will be necessary to address the problem of the overall liability, and to ensure affordability, sustainability and fairness - and which will necessitate the use of a fully independent actuarial adviser to assess any changes to the scheme. However, the package must also mirror the pension changes in the private sector - if not in the fine detail, then at least in terms of their impact. Public sector employees and their unions will see this as a "race to the bottom" and deeply unfair - but this must be balanced against the impact upon the rest of society of the deeply unfair nature of the current situation, and the economic certainty that private sector employers will NEVER be able to afford pension provisions to match the public sector. 1) Given the generosity of defined benefit salary-linked schemes, with the expectation of large (and unlimited) employer contributions, an increase in employee contributions is a necessary first step towards a fairer public sector pension package - and a "staggered" increase from the current 5-6% to at least 10% spread over a period of 4-5 years does not look unreasonable and perhaps 15% in the medium term. 2) Many private sector pensions have now moved to an “indexed career average” salary calculation rather than a “final salary” basis. With annual salary increases and seniority, older workers tend to have maximum earnings in the last few years of their employment. The move to “career averages” is seen as fairer in recognising earnings over the employee’s years in service, and has the obvious benefit of reducing the employers pension liabilities. The alternative, of the average of the best three years in the last thirteen years of service as suggested by the PSPJWG is also a possibility. 3) The key reason for reducing the generosity of accrual rates is affordability. It is a reform that fits well with an increase in the normal state pension age, since a proportionately less generous accrual rate allows a pension of the same annual amount to be accrued from a longer working life. Alternatively, a lower pension could be received from the same age. For example, in a final salary scheme offering a 60ths accrual rate, a pension of two-thirds of final salary can be accrued from 40 years’ service. If the normal pension age was increased to 65, and the accrual rate reduced to 67.5ths, a pension of two thirds of final salary would be accrued from 45 years’ service. Conversely, if in the above example the normal pension age were increased to 65, but the accrual rate was left unchanged, a pension of three quarters of final salary could be accrued from 45 years’ service. If the accrual rate were reduced, but the normal pension age left unchanged, the effect would simply be a reduction in the proportion of final salary that could be accrued. In the above example 40 years’ service at a 67.5ths accrual rate would allow a pension of 59.25 per cent of final salary to be accrued. 4) The “fringe benefits” of a pension are also significant, and include, for example, inflation indexing to the Retail Price Index or the Consumer Price Index. Private sector pension schemes are usually indexed with an upper limit currently of 2.5% - which obviously sets a limit on pension liability. Fringe benefits include half pension to the surviving partner or spouse in the event of the death of the pensioner – a not unreasonable provision, but with obvious costs to the pension provider. 5) The PSPJWG in their report pointed out the very generous lump sum arrangements currently applicable to GUS when compared with equivalent UK schemes – the commutation rate i.e. the amount of pension given up in return for taking a lump sum, is currently 18:1 in GUS, whereas only 12:1 in most UK public sector schemes. An alignment with UK schemes would also reduce the incentive to “cash-in” with the lump sum option – apparently an outflow from GUS of £10 million+ being paid out in lump sums in 2014, and in one instance, a single payment of £420,000. In light of such expenditure, some consideration should also be given to making an element of the lump sum liable to income tax – after all, the contributions into the pension scheme were not subject to tax at the time. The suggestion that the GUS issues can be addressed simply by increasing the employers contribution rate to 20% of pensionable pay is derisory – creative accounting which is massively out of line with private sector employers, designed to ensure that the current shortfalls in contributions get accounted in a different and less obvious way. It is indicative of the self-serving processes within government, of working for themselves and not for the public. The employer contribution is currently approx. 6% (broadly comparable with the private sector for equivalent schemes) but there is a funding gap of 23% - being met currently from pension reserves and the taxpayer. So by increasing the employer contribution to 20%, the funding gap will automatically be much reduced – effectively “hiding” the true extent of the increase in taxpayers liability – rather than questioning the fundamental unfairness of public sector pension schemes as currently evolving. Any discussions will require a “clean sheet” approach, with no limits set, no prior briefings or “understandings”, no protection for vested interests, and a transparent and open process with full taxpayer involvement – not the “old boys club” and the closed doors with conflicts of interest readily apparent in the participants. Do I think Tynwald and the manx public sector unions capable of such a programme ? I regret…….